How is generated the id of an item ? The version 1.4 of the SQLite Sorcerer is just released ! Changes and more after the jump. I am proud to publish today the first public version of the SQLite Sorcerer, a new administration tool for SQLite databases, written in Flex 3 for Adobe AIR. UPDATE (8th of Apr 2009) : your new AIR admin tool for SQLite local databases is now available here ! There are already lots of good tools to manage SQLite databases (only a few developped in AIR) and I already use a good one (SQLite Administrator). But a few months ago, I had to update an AIR application and it was a real pain because of the change in the SQLite database. I was very lazy and I updated the installed database manually instead of developping a class that could perform the migration of the DB after the update of the application it-self. This was of course a very dirty way of working and I want to be more professional next time (even if the application is for the private use of my wife). generate the SQL statements to be executed for the migration of the installed database. 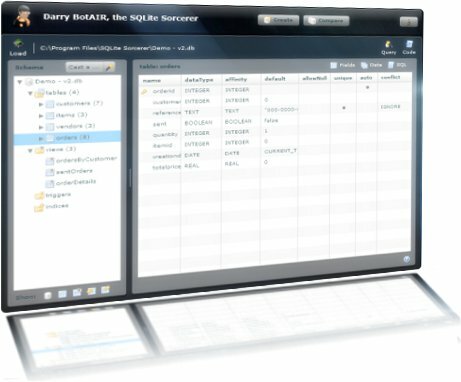 The SQLite Sorcerer or Darry BotAIR, for intimates, is a small SQLite administration application running with Adobe AIR™. Encrypt and rencrypt using a password or an existing hashed key: have a look here to learn more on the feature. Compare the structure of 2 databases ! Just open a second database and the comparison is done ! Get the whole SQL code of the database. The SQL code is highlighted. Click a screenshot in the picture wall to enlarge it. Pass the mouse over the enlarged picture to get some "how to". The SQLite Sorcerer is developped in Flex 3 for AIR. Its primary intend is to administrate local SQLite databases for AIR applications but not only, I would like it to be as "compatible" as possible. So don’t hesitate to send me feedbacks or bugs. SQLite Sorcerer is free of charge. You are free to download it, use it and distribute it. The application will also auto-update each time a new version is published. Nevertheless, if you decide to adopt SQLite Sorcerer as your favorite SQLite administration tool, you may want to make a donation. Especially if you are a company that uses this great tool in a commercial project. or using the donation button in the About (Hat) window of the application. Please upgrade your Flash PlayerThis is the content that would be shown if the user does not have Flash Player 6.0.65 or higher installed.